Our first order of business was to get edibles. When you travel to a new place, the fact that nothing is known or familiar makes provisioning the pantry an adventure. This must be why so many people prefer staying at hotels or resorts where you can just pick something from a menu and have it prepared for you. That’s not my kind of travel. In Hawaii, everything that isn’t grown on the islands is shipped here from somewhere else. I am surprised to learn cane sugar and pineapple are hardly produced commercially any longer. The land, my doctor friend on the plane told me, is just too valuable for housing and tourism. Of the four stores I’ve visited so far, most foods are shelf-stable — food that is dried, pickled, canned, or frozen lasts much longer and survives the shipping process. Enterprising folks take a flight to a larger island, buy goods at Costco, and resell them at a markup in smaller batches. A single can of Kirkland whole tomatoes, for example, cost $1.30. Food is, in a word, precious on Hawaii. Based on a tip from my generous friend, Paula, we knew that the best selection was available on Thursday when the ferry comes in each week. We headed in to Friendly’s, the town’s largest market, and it was packed to the gills with people and products. Picture an old-time dry goods or general store with some local flavor thrown in. Carts barely fit in the aisles. No one was in a hurry — people stopped to hug and chat all around us. Socializing seemed to be the main purpose of being there — with groceries coming in a distant second. To be honest, I felt rather out of place with my grocery list and pen trying to be efficient and systematic. I had to make myself look at people, smile, and say hi. “Yes, I look like a crazed mainlander. That’s because I am one,” I tried to say via my grins. Molokai, I’ve learned, likes to mess with my Type-A side. This is so good for me. Locating the items we needed for a week, for example, proved to be its own adventure. Lilikoi jelly was logically across from the crayons and markers. Wine was located in the same aisle as the motor oil. Of course! Make no mistake, the shelves were very organized, the selection was just smaller than I’m used to and space at a premium. Mary reminded me to laugh and chill out. I confess, I nearly had a coronary event looking at the prices. Any packaged food was likely to be over five dollars – from bags of chips to cereal and cookies. I can’t imagine how people afford to eat on an a budget. The fact that I saw massive, fifty-plus-unit packages of ramen noodles might offer a clue. 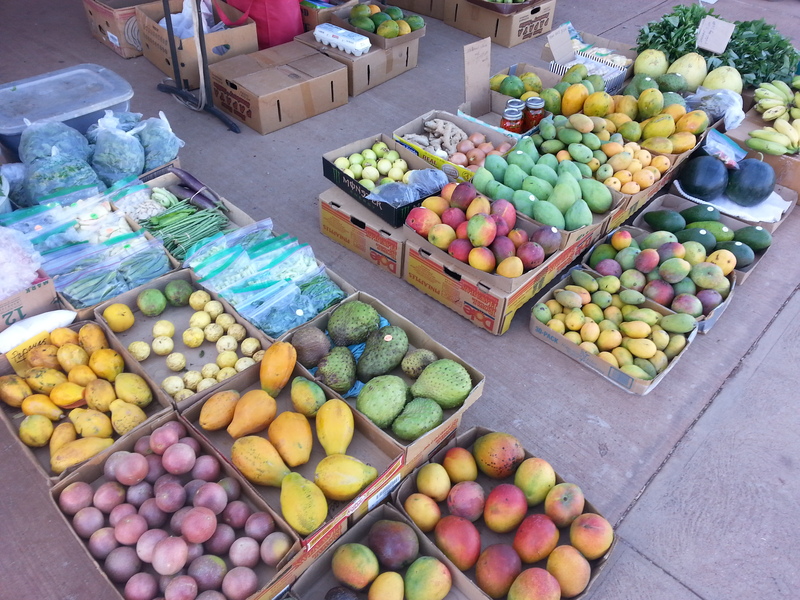 Despite being on the arid side of Molokai, Kumu Farms is eking delicious organic produce from the porous, lava soil. 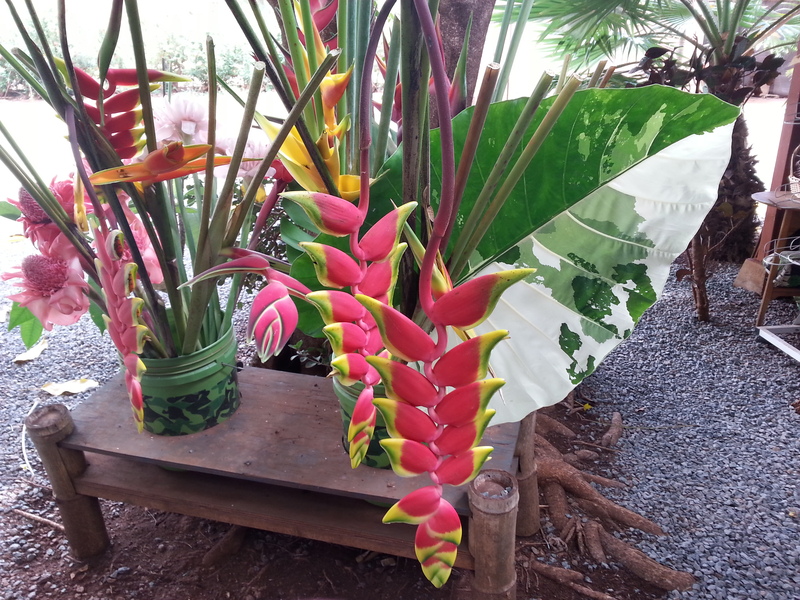 As we pulled up, buckets of tropical cut flowers waved in greeting from Kumu’s sprawling farm stand. Its generous awning provides shade to both produce and people. 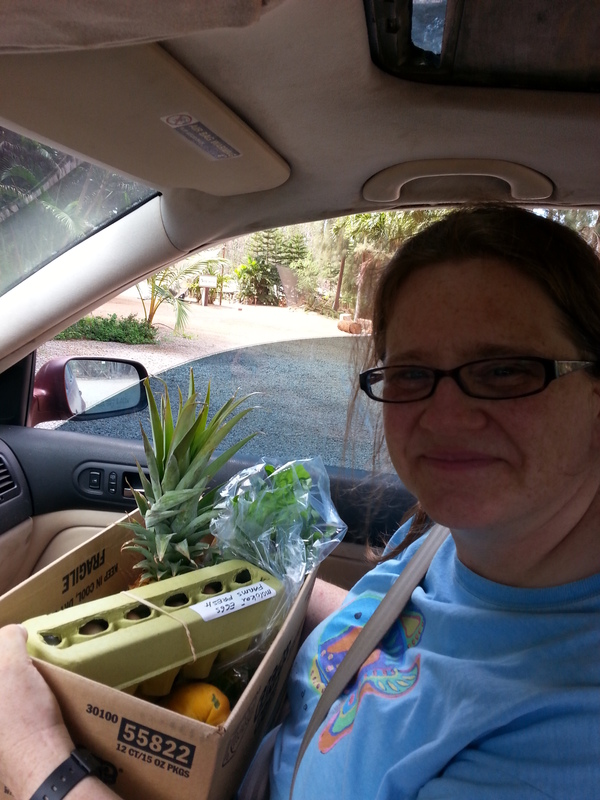 We had a short chat with the friendly owners and came away with a box of goodness: a fresh Maui pineapple, three ripe papayas, an avocado, a bunch of greens, and a dozen local eggs (two in every color) — for which we were rewarded a bag of fresh thyme. The pineapple? Heaven. I mean, seriously sweet, juicy heaven. And Mary said the sunrise papaya was the best she’d ever tasted (and Kumu Farms ships worldwide, in case you’re interested! ), reminiscent of a really good melon. I am amazed. I didn’t even think I liked papaya! The adventure is in trying new things and discovering you were wrong! Heaven on a cutting board. Sorry for the blur. I couldn’t wait to eat it! When the weekend arrived, we drove into Kaunakakai (go ahead, try it out, armchair traveler: cow-na-ka-KAI) for their Saturday Market and were amazed by the produce selection. What baffled and humbled me was how many items I could not identify. Huge spiky green fruit. Saggy tennis-ball fruit. Bag of pointy-looking greens. Monstrous lima beans in Ziploc baggies. When I eyed the blushing red mangoes, the woman told me, “It’s the best kind.” This sparked a thought that there might be as many kinds of mango as apples. The thought!! “Rapoza,” she replied and turned away from me. She removed a container from a cooler under the table, and returned holding a fork with a mango chunk skewered on the end. The juice hit my tongue and the fruit burst was rapture. “Oh, my God.” We bought three. Our Saturday Market haul. Check out that avocado! Scraping the pulpy, seedy insides as instructed, I downed the tart-sweet lilikoi (passionfruit) as soon as we got back to our abode. 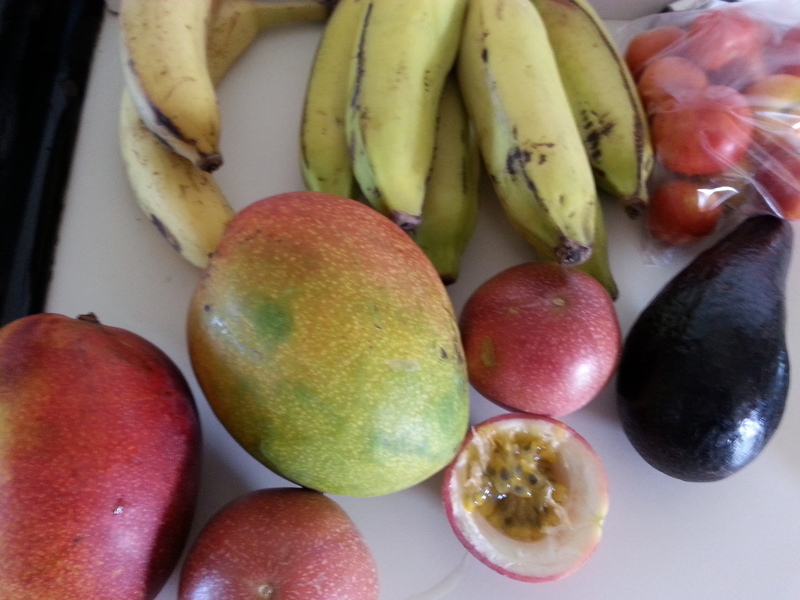 Then I chopped up the ripe mangos to put in the fridge, tasting (and moaning rapturously) as I went. Sadly, I soon discovered that all this adventurous eating tipped the scales on my nervous gut. I’ve sworn off mangoes for the remainder of the trip (POUT! 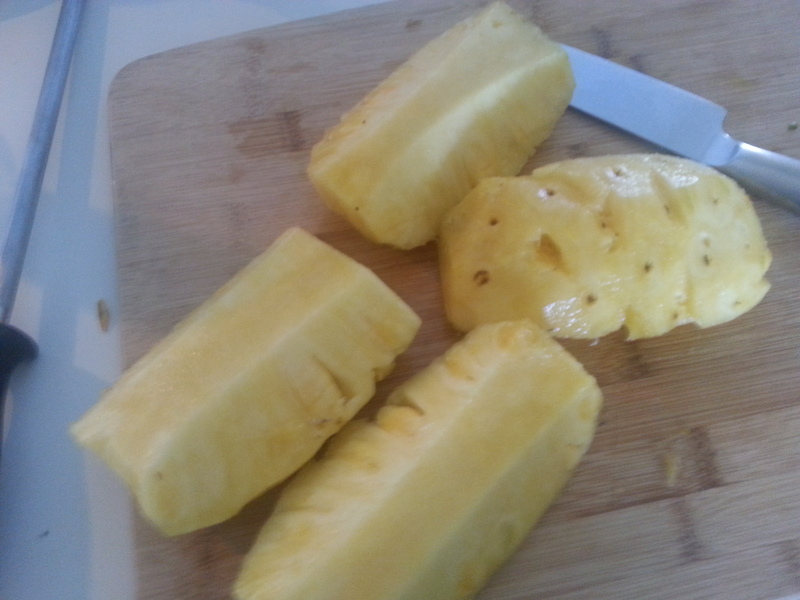 ), but pineapple and several varieties of banana (apple and Williams, to be precise) are ON. I can’t wait for next Saturday’s Market. Now I will fit right in!